A program which produces sounds when keys are hit or mouse buttons are pressed might not be useful and practical to most users. But for kids or computer illiterates, the Sounding Keyboard and Mouse app can stimulate interest and encourage these groups of users to persevere with their computing experience. The Sounding Keyboard and Mouse is an interesting application which can turn users’ keyboard and mouse into musical instruments. The tool will specify wave file and midi note to every key on keyboard and mouse buttons. When users press on the keys or click on the mouse buttons, the assigned sound will be played. It adds a little bit of music to your typing and makes the typing less monotonous. Of course some users might feel that the sound effect is annoying and disturbing. 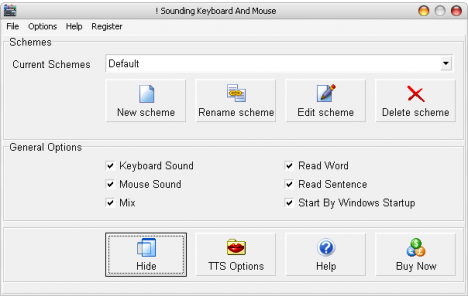 By adding TTS Engine (Text To Speech), users can modify and allow the Sounding Keyboard and Mouse to be programmed so that the app will vocalize the text which users have typed. The program will read out the words or sentences at the completion of each character or each word or each sentence type. This feature will help the blind and those who have eye sight problems substantially. The Sounding Keyboard and Mouse app is not free. However, users can download the trial version to experience the effect.